Our BEST VALUE Custom Printed Round Stickers and decals are available in 6 different materials which includes: White Vinyl, Clear Polyester (front or back face), Chrome, Brushed Chrome, White Static and clear Static (front or back face). These outdoor durable custom printed round stickers can be digitally printed for that beautiful full color photo look or screen printed in one or more spot colors. Not sure what will work best for your project, our design staff will advise you on the recommended type of material for your application needs. Please specify application specifications when ordering. 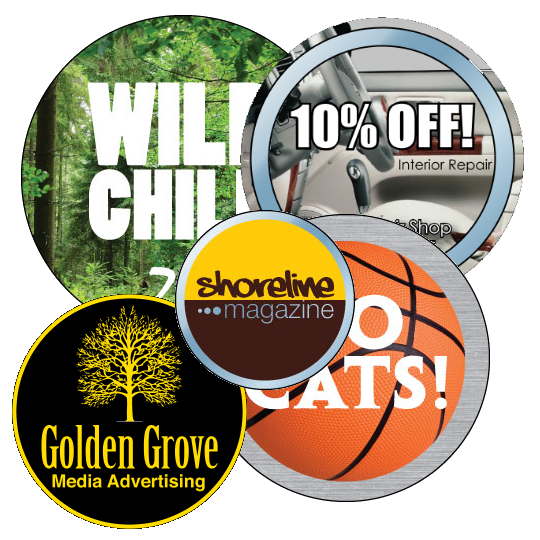 Check out our Spring Sale for savings on Custom Printed Round Labels & Decals and Round Stickers in the following link. 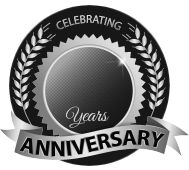 BBB Member since 2004 with a proven record of complaint free customer satisfaction on items like Custom Printed Round Labels & Decals. Click on the BBB logo above to check our record or leave a customer review. If you are in the market for Round Stickers, give us a call today and you will soon realize why after 24 years we still have an A+ BBB rating! At deSIGNerySigns.com we have more than 24 years experience in designs for our Round Stickers. Call us today and let our design specialists help create your next project to promote your product or business. FREE Shipping on all decal and sticker products | Free layout | A+ BBB rating | 24 years in the business | Call Today for a free quote on Round Stickers. deSIGNery Sign Co. offers six different materials for your custom round sticker projects. For back adhesive round stickers, choose from our white vinyl, clear polyester, chrome, brushed chrome, white static and clear static cling materials. For your front adhesive requirements, choose between our clear polyester or clear static cling materials. We suggest that round decals with face adhesive have a white background printed behind the colors to make them appear more opaque. The decals are easily removed from its protective sheet and applied to the glass surface so that it is readable from the other side. White is an additional color on transparent & clear stickers. Please indicate if white is to back art only or flood of entire oval decal. Ask our design staff for suggestions on the proper way to backup your custom clear stickers for visibility and readability. If text strokes are to thin, a white outline may be required to increase readability. White is priced as an additional color. Because our best value circle stickers are screen & digitally printed on premium vinyl or polyester stock using UV inks, they can be used outdoors as well as indoors. These are a great value when you need a custom round decals with vibrant colors, and is used in an area where there is not a lot of solvents or abrasion. Great for company identification or corporate company logos. Our round decals add a touch of class when used on your equipment or products to convey whatever message you have in mind.